I have to say that when I say I’m in, I’m all in. I’ve done a complete turn around from not really knowing who Joseph Pilates was to solely teaching his method. I’ve taught Pilates since 2000, and although I’m grateful for my contemporary Pilates education, I never quite felt like I fit into that world. 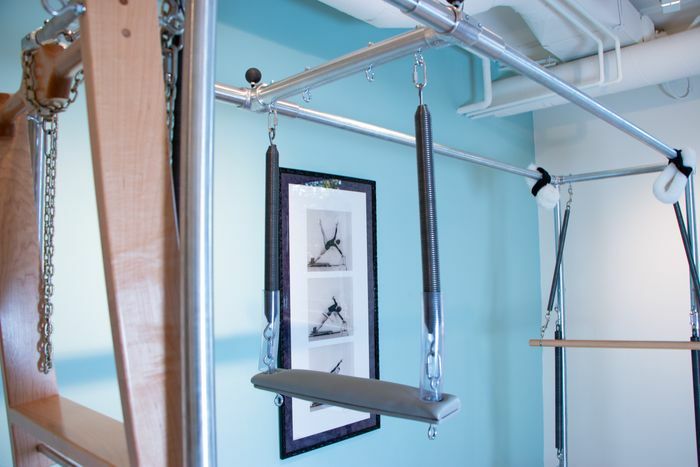 I dipped my toe into the classical Pilates pond a few years ago when I first took a private lesson with Andrea Maida at her Solana Beach studio. It was so different from what I was used to! Those springs were heavy, and that strange silver reformer with its leather straps was so hard to move all the way in! And Andrea didn’t talk at me—she watched me move. In November 2017, Going More Joe popped up on my Facebook Feed, and I decided to join the group. I had been following Andrea’s blog for a few years, and I had done the private lesson with her, so I sort of had an idea of what classical Pilates was. Going More Joe spoke to me—there I found Sunni, a former contemporary teacher like me, who now taught classical Pilates. GMJ also included a group of classical teachers who were willing to answer members’ questions with straightforward and honest answers. I was excited and inspired! I was so inspired that I started taking private lessons with Andrea. After practicing for a while, I decided to try the order on my clients—my clients thought it was really hard, but I was excited, so they stuck with it. And they got strong after having been with me for years. I got emails and texts from them saying how much they loved my “new” teaching style because they were getting so much stronger and more flexible, and they really liked the hands-on cues and assists. As a contemporary teacher, I did a lot more verbal cueing versus hands-on cueing. True story: as a fairly new teacher in one of my first practical exams, I got points taken off for “aggressive hands-on cueing.” I still laugh at that today because the instructor who was my body had on a loose top without a bra and I gave her a hands-on ribcage cue! Oh my! I had to get over some fears to be able to touch my clients again. So I watch Pilates-ology...…every chance I get. Alissa Wyatt has some great hands-on teaching videos so make sure you check those out! If you already give hands-on cues as a contemporary teacher, then you’ll just need to apply your knowledge to the classical work you’re learning. I do recommend practicing with another teacher first and have him or her practice on you so you know what's happening in your body. The feeling of classical hands-on cueing is different because in my experience the cues are much more physical. Finally, a bridge program is what we ultimately will need if want to learn the entire system and teach it correctly. It’s really that different (that’s also another post—on how to choose). Along with giving better hands-on cues, I’m learning to be quiet, to observe my clients, allow them to move, and give only meaningful cues, instead of offering my former steady and constant dialogue (I think my clients used to tune out at the beginning of our lesson). Jay says “let the body talk to you” and so I’m trying to be a better observer and let my students move and make mistakes. There’s also a clear system in place with this method, and because of the order, my students are progressing again. I used to cherry pick exercises and skip what I didn’t like. Now my students do the entire order (unless there’s a reason not to). My senior group, which ranges in age from 65-80+ years old, went from taking the whole hour to do the beginning order to complete it in about 35 minutes. Classical Pilates has also affected my life on a more personal level. I was sick for a long time, beginning in 2008. My body gradually deteriorated until I had to use a motorized cart in Disneyland in August of 2017, the lowest of my lows. I could barely walk across the parking lot to get to my doctor’s office. I’m not sure how I managed to keep teaching throughout that time. As I started to feel a little better, I was able to begin practicing Pilates again. In about a week I went from barely doing two knees-off knee stretches (shaky and couldn't get the carriage in) to doing the entire beginning reformer order plus some intermediate exercises. In two months time, I was strong enough to do Rowing 1-5, and Front Splits, and now I’m working on tendon stretch to the side (except now I have a Gratz 80” reformer, and that's yet another post) and have added all the exercises in Jay Grimes’ order for the assessment for The Work. That I’ve gotten well is just short of a miracle, except it’s not really, because I’ve worked hard for it. My body has gotten so much stronger with the original work, and because there’s an order, I hop on my mat or reformer and do it. If I miss a day, I've found that because of my previous illness, my body hurts. I’ve found that I need Pilates. Did you know that the Double Leg Pull is the epitome of the two-way stretch? It IS in all the exercises! I also got to do a workshop with Moses Urbano. He taught hands-on assists he learned from Romana and told stories about when he was a student of hers. I love hearing about the history of Pilates. That was also missing from my contemporary training, and I enjoy finding out about the different lineages. I also met Lori-Coleman brown, who I adore and watch on Pilates-ology every chance I get. I felt like a kid in a candy store. I go to Vintage Pilates when I’m in LA visiting family and will go to Fall Camp at Vintage in September (2018). I practice my reformer and mat assessments as I plan to assess for The Work with Jay Grimes. I’ve never worked so hard as a Pilates student and I’m fully immersed in Joe’s work. Now that Vintage Pilates will be closing its doors in October 2018. I'm sad but excited to see where it is headed. When I said I was in, I meant it! In July, I added all new Gratz apparatus to half of my studio, including a Reformer, Cadillac, Electric Chair, Wunda Chair, Ladder Barrel, Spine Corrector, Mini Barrel, Pedi-Pole, and a High Mat. I’m the first to have a Gratz studio in the Sacramento area. Sacramento needs classical Pilates, and as I learn more, I aim to spread the word. As I progress and learn more, I’ll open a second, all classical studio. I consulted with Karen Frischmann about opening a new classical studio, and she was extremely helpful in helping me slow down and take my time. Her advice was a such a gift because I tend to want to do things right away and sometimes one needs to sit back and take time to put things in order. Pilates as a system was missing from my body, and I credit Sunni and Going More Joe for helping me to find me again. Andrea and the folks at Vintage have also helped me immensely. I have my life back. Thank you, Sunni for introducing me to the Classical world of Pilates. I finally feel like I have a Pilates community where I fit in. I’ve found my tribe!